The issue starts, not with Diana, but with the little boy from the last issue and yes, he is with his mythical "friends". As of now, we still don't know what's going on with them, but you can only guess that it has something to do with Ares and his grand escape from his Amazonian prison. While I thought these guys were the least interesting part of the last issue, I am eager to see what is going on with them and the larger mythological picture. One thing we do get here that we didn't get the last issue is a real Steve Trevor sighting. One of my biggest problems with the last issue was also Cary Nord's art. Not only didn't it have the wow factor I expected from such a big first issue by this creative team, but the lack of detail was very disappointing. During the two week interval between issues, a bunch of us in the Get Fresh Crew (whoop whoop) have been debating if the cliffhanger with Ares was hinting that the God of War was taking Steve Trevor's body for a test spin. That doesn't seem to be the case but only came up because of Nord's art. 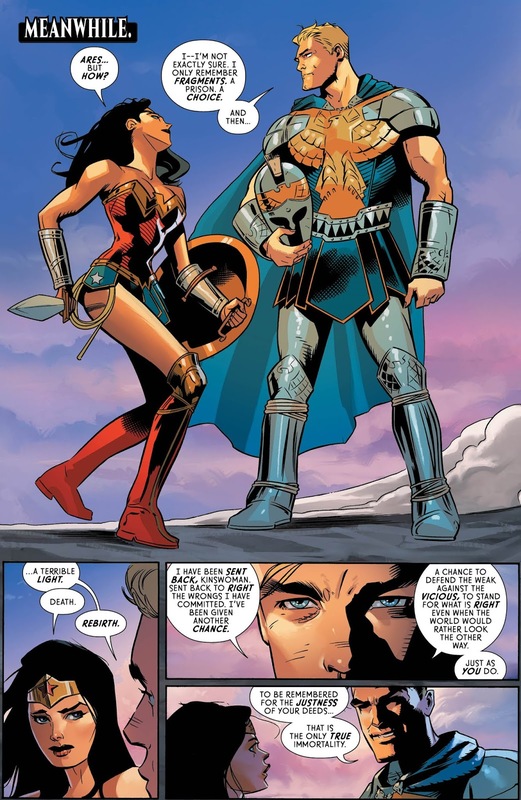 We then get to Diana and Ares and while Ares says all the right things, Diana really has no idea how to take it. Really, this is one of her greatest, most deadly villains who now is telling her he wants to live his new life by asking himself, "What would Diana do?" The problem is, he really doesn't know what that means. Wilson continues setting up her political story and this bit with Ares is a little more subtle than some of the last issue. 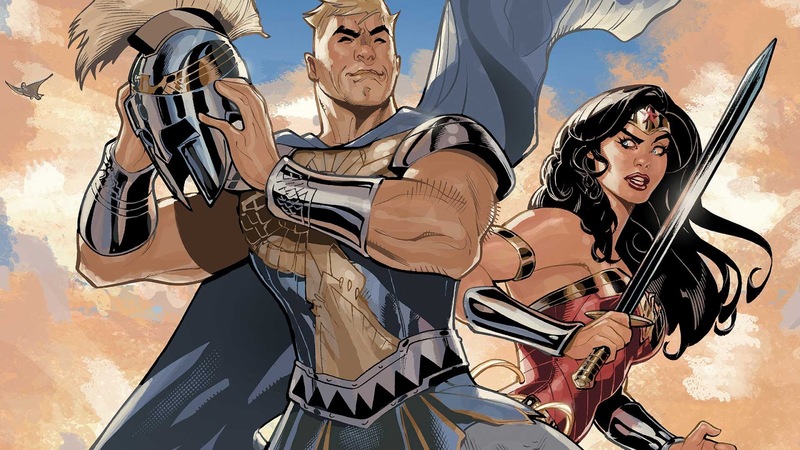 Ares is all about Justice and he is going to deal it out as his prime directive no matter who gets in the way...even Wonder Woman. Check that...especially Wonder Woman! Back with Steve Trevor, he hears that Diana is close and after pleading with the creatures to leave her be (and getting a ton of non-bird shade thrown at him), he escapes. Actually, he just walks away! The issue ends with him back in hot water and a setup to see who is the big bad behind all of what's going on. Yea, this is pretty much the same as last issue...maybe even a slight downgrade. Wilson is taking her time giving us any sort of information and what we are getting doesn't have me excited at all. 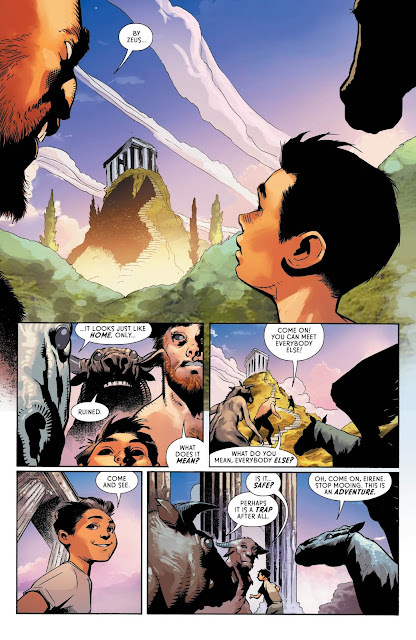 I want more of Diana and Ares and less little boy and his creatures and the cliffhanger throws in another factor that I wasn't really even wondering about. 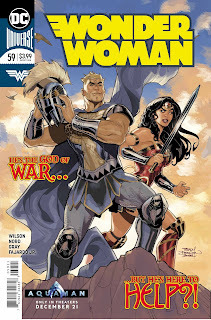 The biggest downer is that I want to see how well Wilson has a grip on writing Diana and we barely get any of her in this issue. I am still on board here, but only because of my love of G. Willow, not what we've gotten in two issues of her run so far. I still do not like Cary Nord's art at all. Everything looks muddy and it's just not pleasant to look at at all. I really hope this part of the book improves going forward. G. Willow Wilson continues her run and while I really want to love it, I just don't. This issue doesn't have a whole lot of Wonder Woman in it and what we do get is just not that interesting. That is the problem with this entire issue...nothing from the story to the art really has me excited about the run yet. I do think we will get there soon, but sadly, it's just not happening now.